Nance & Underwood Rigging and Sails offers the Tides Marine Track and Sail System for an assured high quality and proven track system for all full batten sails. 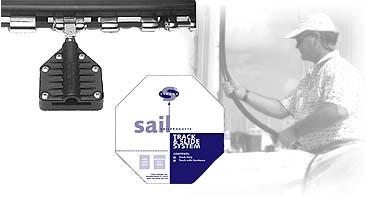 Track and Sail System is a high-performance, low friction mainsail track and slide system built to handle the increased loads and demands of today's full batten mainsails. When installed, the mainsail will rise easily and drop the instant the halyard is released. The System consists of the ultra low friction, durable Track and an "owner-defined" selection of matched slides and batten receptacles designed for smooth, long lasting operation. The System is priced on a per-foot basis and shipped via UPS, ready to install. The Track System offers minimal stack height, less weight aloft and low friction performance rivaling systems costing more than twice as much. The System consists of the ultra low friction, durable STRONG® Track and an "owner-defined" selection of matched slides and batten receptacles designed for smooth, long lasting operation. The System is priced on a per-foot basis and shipped via UPS, ready to install. Track is machined to size from UHMW-PE. This material has a very low coefficient of friction and is impact, abrasion and wear resistant. The UHMW-PE is not affected by saltwater and is UV stable. It is available in seemless lengths to 65 feet and can be installed without going aloft or without drilling holes in the mast. Each track shape is matched to each vessel's mast. The system will work with flat or round internal; grooves as well as external track. Slides are finished to a smooth, low-friction surface, eliminating any sharp edges which can cause conventional slides to bind. They are available in three standard sizes…headboard slide (3”), reef or batten slide (2”) and intermediate slide (approx. 1”). Batten Receptacles are available in two sizes and accept round and flat battens. They attach to a universal joint and 10mm stud. The 10mm stud threads into the Batten Receptacle and the universal joint connects to the 2” slide with a clevis pin and ring. This “fitting” rotates freely when the mainsail is raised and lowered. The top of the mast gate should be at least 10” above the gooseneck and be three inches long. This is necessary as the Tides Marine track needs sufficient room to bend/curve into the mast gate while clearing the gooseneck hardware / boom. In most cases, the Tides track should slide smoothly into the mast gate and up the mast. If you think a lubricant is needed, use only water or water combined with a very small amount of liquid detergent. Other lubricants such as WD-40 can leave a residue on the track/mast which can collect dirt, dust and debris.